This custard recipe is fast and easy. You can make it without a double-boiler, it takes less than 5 minutes and you can make it dairy free. 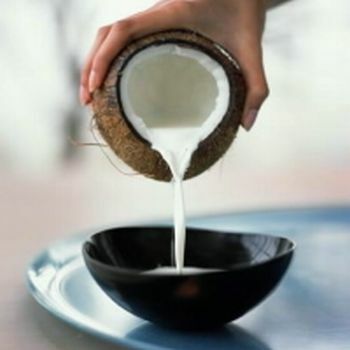 Use coconut milk for an extra decadent treat, it tastes amazing! NOTE: If using soy or coconut milk, depending on the brand of milk and also on the colour of your egg yolk, the final colour of your custard may look a little “grey”. If this doesn’t bother you (it won’t affect the flavour) then leave it as is, but if you want that lovely yellow custard look, then add a few strands of saffron threads into your milk in the first stage to impart a beautiful golden colour. Put your milk onto a medium-low heat to gently head, reserving about 60 ml aside in a bowl. While your milk is heating beat the egg(s), vanilla and sugar together in a bowl until thick and creamy. Whisk together until well combined and then pour back into the saucepan. Continue whisking/stirring until mix returns to simmering point. Custard should start to thicken. In the bowl with your reserved cold liquid add 1 heaped tsp of potato startch/flour and mix to a smooth paste, then add to hot custard, stirring/whisking your custard the whole time. The custard should quickly thicken. If your custard is still not thick enough to your preference, then repeat this step with a little more potato starch and liquid, always adding the potato starch to cold liquid (you can use a llittle water or a bit more of your milk) and mixing well before adding to the hot custard (otherwise you will get lumps). As soon as your custard reaches the desired thickness, remove from heat. Taste for sugar and vanilla and add more of either to taste. Easy. Perfect, creamy thick custard.